If you are a fan of the much-loved and charismatic Suriya then get ready to rejoice as we have some awesome news in store for you. 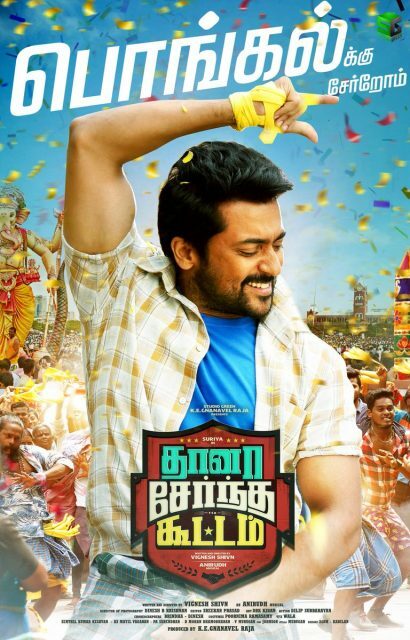 The makers of his eagerly-awaited ‘Thaana Serndha Koottam’ have confirmed that the film will hit screens during the festive season of Pongal in 2018. Interestingly, earlier it was speculated that it would join the Diwali race and this had created quite a buzz amongst fans. However, this announcement is bound to put all such speculation to rest. In case you did not know, ‘Thaana Serndha Koottam’ is touted to be a crime-thriller and is being directed by Vignesh Shivn. Besides Suriya, it also features Keerthy Suresh in the lead. The supporting cast includes names such as Ramya Krishnan and RJ Balaji. As it so happens, it was originally believed to be a remake of the Akshay Kumar-Kajal Aggarwal starrer ‘Special 26’. However, a source that clarified that the film would be pretty different from the Neeraj Pandey directorial. “The core plot of Special 26 has been adapted, and the makers have made a lot of changes in Suriya’s characterisation. He plays a CBI officer in the movie and the present schedule involves a lot of character artistes,” the source had added. On a related note, ‘Thaana Serndha Koottam’ was recently in the limelight when a video from the shooting spot got leaked on the social media much to the shock of everyone concerned. So, how do you react to TSK not hitting screens this year? Comments, please!